Valentines makes me thing of sweet, precious and of course all things girly. This is also a sneaky reminder of the "Cloche Party" coming up on the 19th of Feb. Check my sidebar for details. I've created a little vignette with my favorite pictue of my granddaughter. I found a wonderful frame at GW that was just perfect for this little pic, so of course I had to start playing. Everything looks better under a cloche, just add a little lace and since she is playing with pearls, a few pearls and tassel for the top. See the pearls. She is almost grown now, but she has always loved pearls and playing with yards and yards of them when she came to visit. 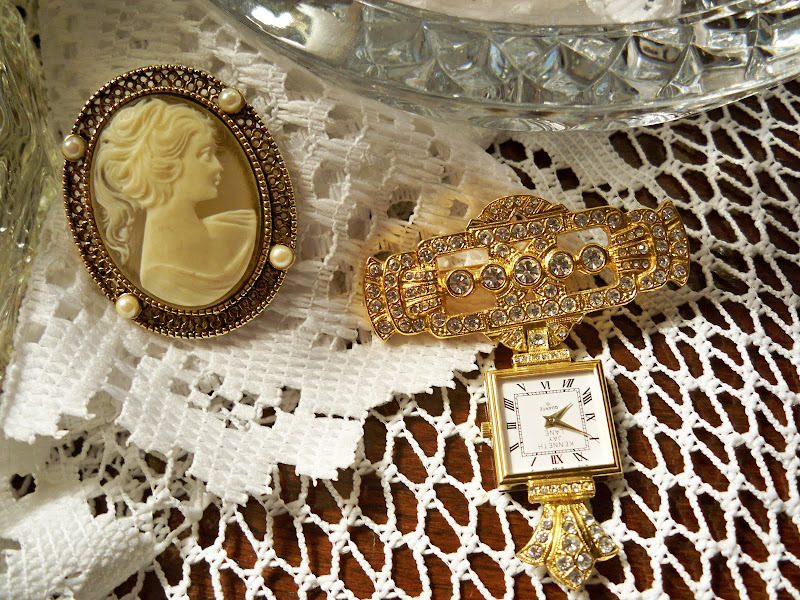 The lady pin and the diamond clock as she called them were among some of her favorites. Nothing sweeter than little girls playing dress up. I always wore pearls and had yards of them for her to drape everywhere. Brings back tons of precious memories. She's still the same sweet little girl and such a blessing. Thanks so much for stopping by, I always appreciate your visits and look forward to seeing you at the "Cloche Party". That is surely a picture to treasure-she's beautiful! And you have done it great justice with your lovely vignette. I may just use this for inspiration as I also have a favorite picture of my grand-daughter. Lovely!! Such an adorable little one. Memories like this are such a beautiful way to decorate. Lovely post! Awww! How precious - beautiful vignette. Love the cameo. 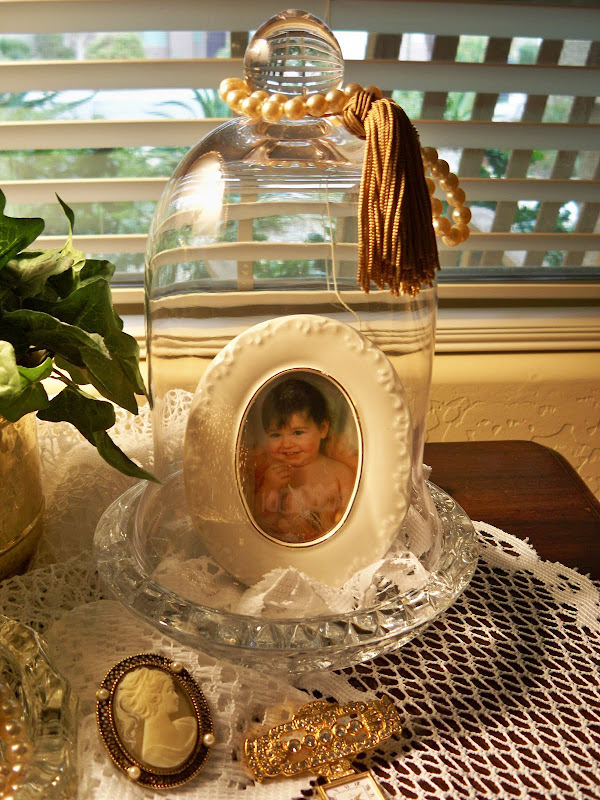 What a sweet picture of your granddaughter and a lovely job on your cloche vignette!! Wish I had a little one to put under a cloche! Did I tell you we are going to play Grammy and Papa to some fellow missionary friends children (6 mo and 2 years) for a week in March? Oh my it has been so long since babies I don't know if I will remember how to! Company left this morning and back is some better so thinking about getting a bit more done on that wallpaper! nice pctures Marty!! !what a beautiful little girl...i love all the pearls and watch, lovely!! Your granddaughter is absolutely adorable! Love the way you put the cloche together with the jewelry accenting it. I'm getting ready for your party. I have two completely empty cloches and a third ready to transform. All I need now are some creative ideas. I'm wondering how long I can look at the emptiness and still not fill them? HI Marty! Oh, this is just so precious! I love that sweet little picture of your granddaughter and that little smile! 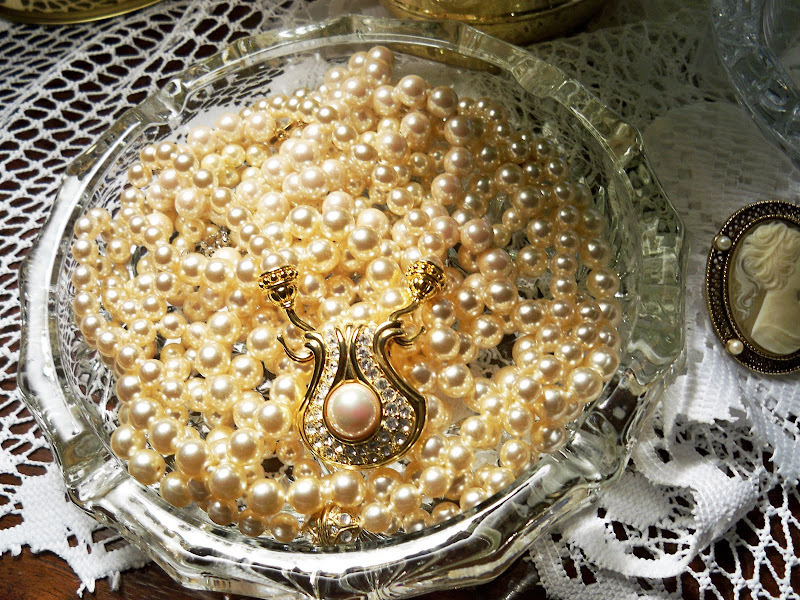 The pearls are so lovely and you've arranged everything so beautifully! Can't wait for your cloche party! Love your post. So adorable and beautiful at the same time. You put objects together so well, and your cloches are always fantastic. Love to pop in here and see what you are up to. Your granddaughter's photo is so cherub sweet. And I too, love to use pearls! Watch for them at Goodwill. Have a great one! enjoyed my visit. Marty, such a lovely post. I love the vignette and the picture of your granddaughter is adorable!!!!! It all makes me smile. How cute is she? I'm loving all the pearls too. thanks for playing along and enjoy your day. Marty, how sweet having such sweet memories of your granddaughter. I hope to have fond memories of mine, to as they grow up. I just wish we lived close by so I could spend more time with them. Oh what a sweet picture! I love pearls as well -- they're the birthgem for June. How lovely. And such beautiful memories. what a precious vignette you have created! I will be joining you at the cloche party too. I've got so many ideas... hmmmm what to do? What a darling picture...she was precious! I love the pearls. Oh your granddaughter is so cute with her picture all dressed up in your pearls. Just precious Marty. Like the cloche too. Hi Marty! This is sooo beautiful! 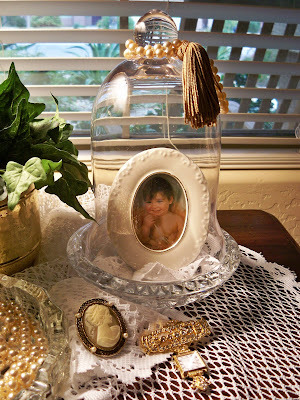 What a lovely idea with the cloche and pearls and picture. Such a beautiful grouping and it is soooo precious! Once again my dear you have outdone yourself! Your little Granddaughter is so precious. And she loves pearls, what a girlie girl. Using the cloche to show her picture is fabulous. I love it. Beautiful tribute Marty! The photography is so gorgeous. Pearls are one of my favorite things. So incredibly creative and so incredibly beautiful! I love your ideas! So precious! Your vignette is beautiful ~ as usual. How lucky you are! You have a cherub for a granddaughter! What a precious photo!!! And having it under glass makes it even better. 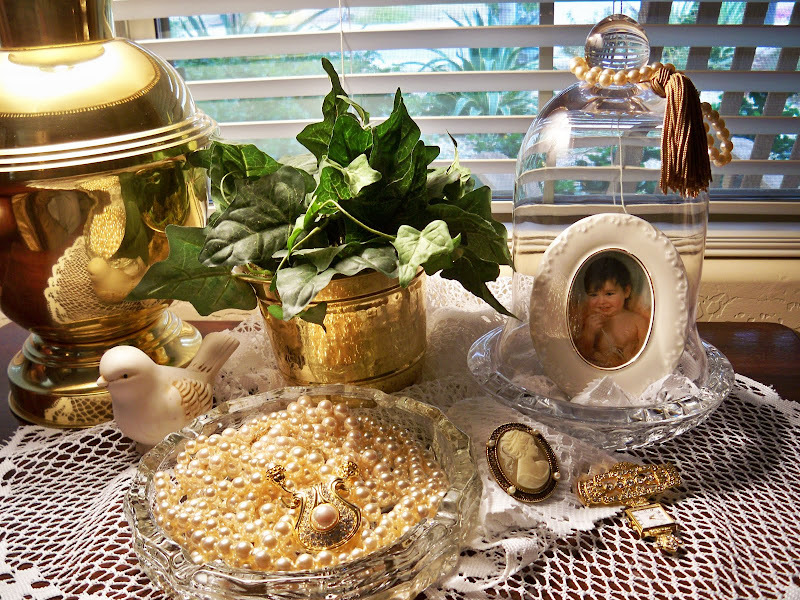 I love how you placed pearls in your vignette as well. Fabulous!!! And thanks for leaving me a comment today. P.S. I still tweaking my cloches getting them ready. I'm a little happier today with them than yesterday. But I will still probably tweak them some more before the 17th. Lovely little one in your lovely cloche. I think the pearls and the jewelry are so pretty. Such a sweet display and I love your picture of your "little" girl with the pearls! Beautiful! Your pictures remind me of my Amber when she was a little girl! So sweet and lovely. I wish I could give my Amber one more hug! What a sweet post..she is adorable! What a beautiful baby picture! I just love all of this, so pretty and romantic, my favorite yet, I think! Gorgeous pearls and jewelry! I'm already working on some cloche photos! Sooooo sweet! I am planning on getting something together for the cloche party. I enjoyed the last one. Thanks for inspiring us. This is such a beautiful vignette Marty and all those beautiful jewels looks so pretty. You are such a proud Grandma! Guess what, I finally found a cloche! See you at your party! Grand daughters will remain little forever!!!! Pearls, oh how sweet that picture was!!!!! Marty, How precious she is and how beautiful your post. So lovely and elegant. Hope you have a great weekend, we are headed to Lee's Chateau for the weekend. We are so excited. What an adorable picture, and such a pretty way to display it. I love hearing the memories that you'll always have to cherish. Your own perfect cherub is just precious. Did I tell you my email account was compromised? Sigh. I would like to imagine that the people spending time doing this could use their time in a more productive way and bring peace to the world. What a wonderful White Wednesday post you have! 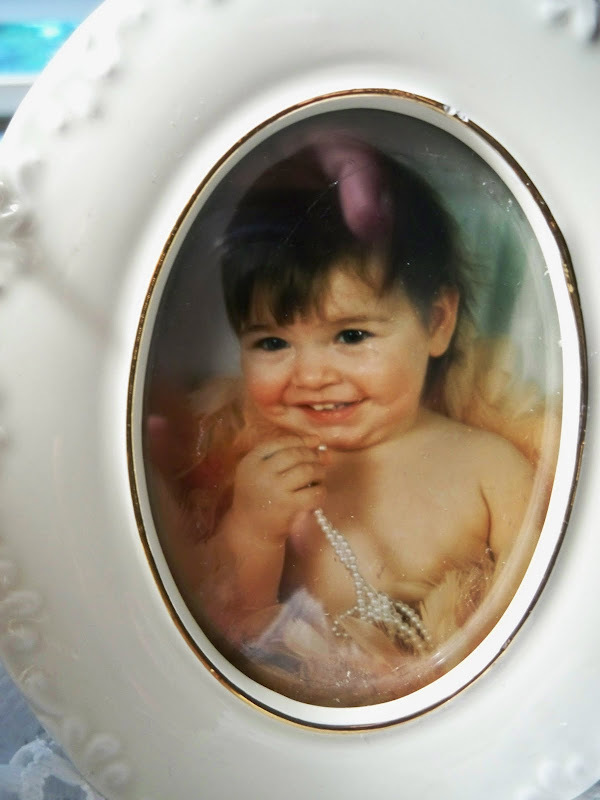 I love the frame for your granddaughter's darling photo and of course all of those wonderful pearls and other lovely jewels! How sweet. You are such fun! I'm planning on your WINTER cloche party! What a precious way to display your memories.. beautiful Marty. What an adorable picture and she has the sweetest smile! Love your vignette! What a sweetheart Marty!! Your vignettes are so beautiful - always! I am getting so excited for the party next week! Ohhh..what prettiness! Is that a word? Hmmm...well, it should be! What a gorgeous vignette, Marty! Of course, you know that I just adore pearls...is there anything prettier? A pearl just embraces everything soft and feminine!!! Love all of your pretty pearls! Ohhh...and what a precious photo of your granddaughter...I see that pretty strand of pearls that she is holding! Sooo cute! Marty, your cameo and diamond brooch watch are gorgeous! I also love cameos! Ohhh...I know that you are getting busy...gearing up for our cloche party! I'm so excited!!! But I must confess that I haven't had the chance to do up my cloche or apothecary yet! Eeeks...I better get busy! Hehe! It's been hectic here with my daughter and grandbabies surprise visit..but I've loved every minute of it!!! Thank you so much for coming by and taking a peek at my Beloved Valentine table, Darlin'! I always...always enjoy our visits and look forward to them!!! You are such a ray of sunshine to me, my friend!!! Marty, if ever there was a meme for you it is Goodwill Goodies! Your cloche is precious with the picture and your tablescape is so pretty....love the peacefulness ad romance....beautiful!